March brought visits from family and friends which was such a fun time. We also had visits from the plumber, dry-wallers, Daniel's installation, and Fios (for cable). It was a busy house, but excluding the week of strangers in our home it was a wonderful time. Here are some photos from the week my sister and her family came to visit. They met us in Orlando on Saturday evening. 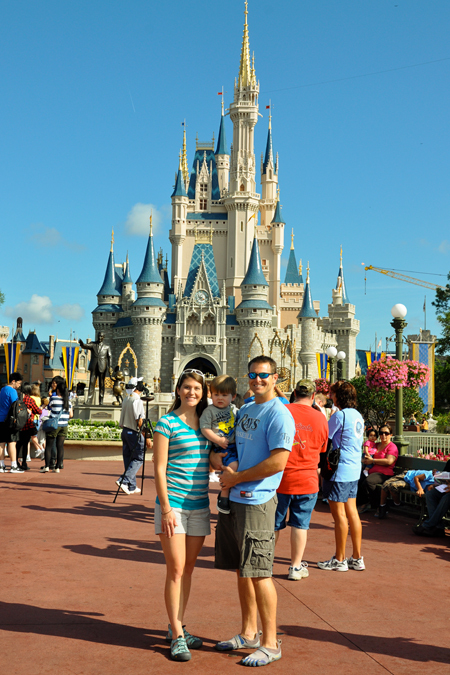 We went to Magic Kingdom on Sunday and Animal Kingdom on Monday. When exiting the ride Buzz was greeting all of the children. You may not be able to tell by the photos, but B was so excited. 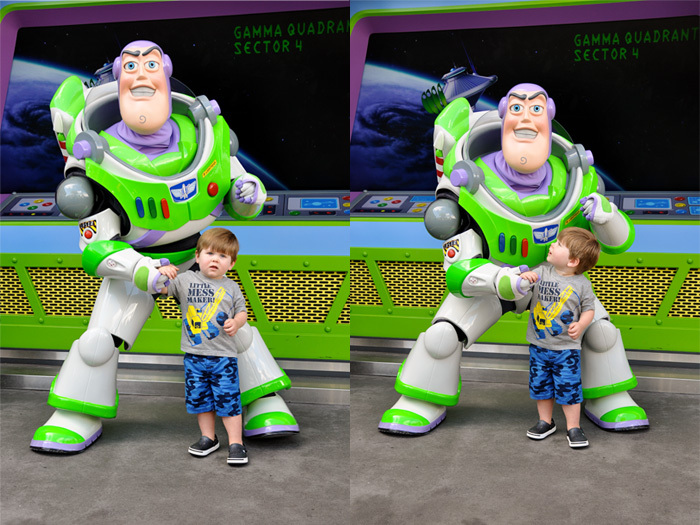 He kept yelling, "Meet Buzz Ightyear. Shake his hand. High five." He was very mesmerized with him and asked to meet him again at the end of the day. 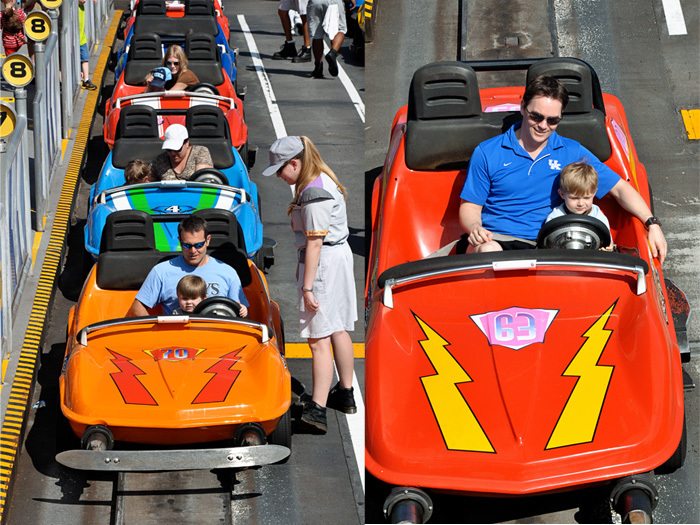 Then, the boys drove the cars which was a huge hit. It was one of only two rides that they rode twice. 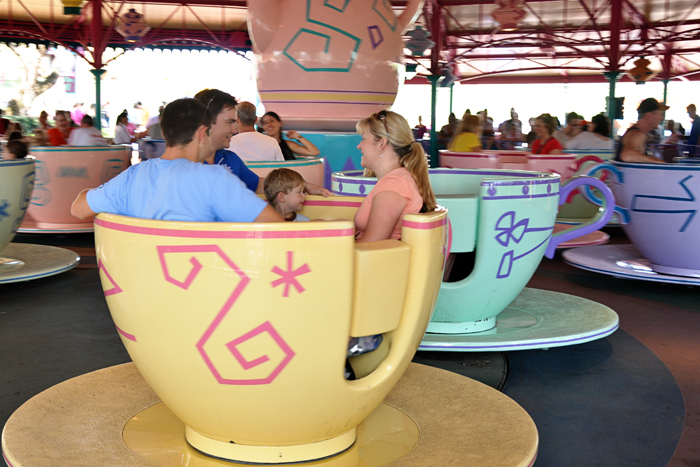 Everyone rode the teacups excluding me. This momma doesn't do well with things that spin. You can't see B, but he is sitting beside Sam. Then, it was time for It's A Small World, which is probably my favorite. If you can't tell the boys really liked it too, so much so we couldn't distract them for just one photo. 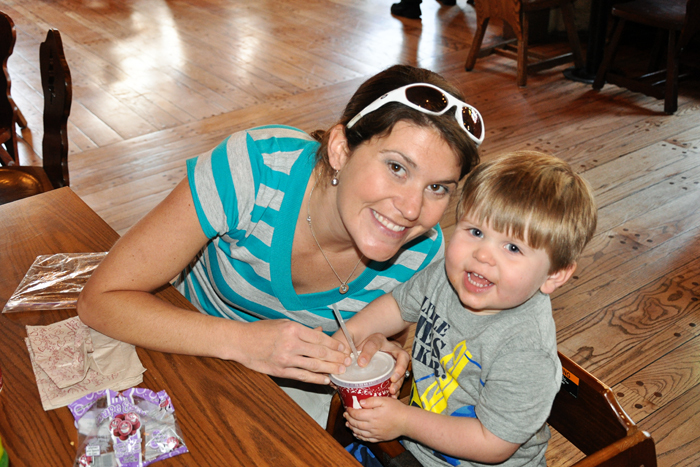 A little break for lunch where I asked daddy to take a rare photo of B and I. At this point, Braxton was getting really tired. Some how B was still ready to run, run, run. 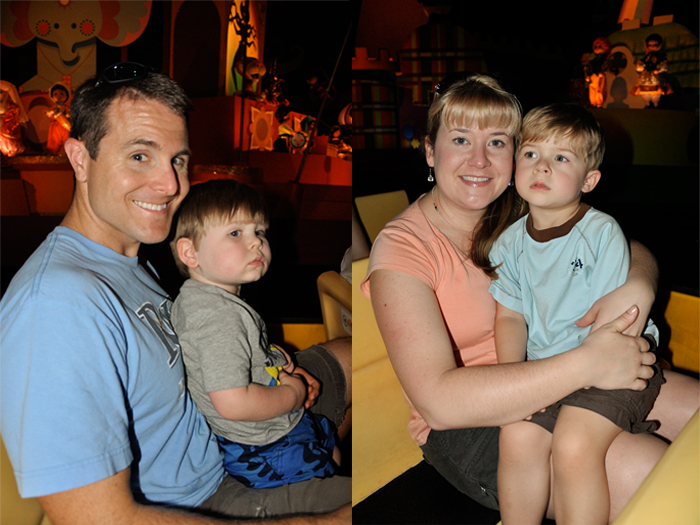 After lunch we rode the Pooh Bear ride while Chris strolled Brax around for nap time. Good thing, because the Pooh ride is very boring....in my opinion. Soooooooo glad we had a fast pass for this one, because it would not have been worth the wait. 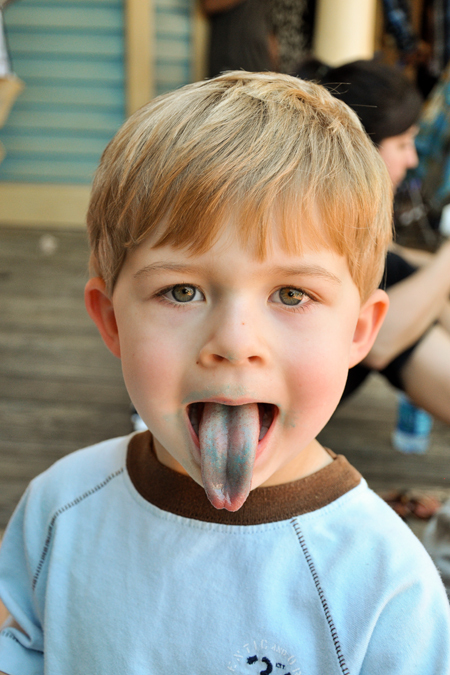 Once B fell asleep, Brax woke up shortly after and enjoyed a HUGE, blue lollipop before heading over to Tom Sawyer Island with his family. While B slept we saw that Woody and Jessie of Toy Story were out for meet and greet, so we parked the stroller nearby just in case B woke up and was able to meet them. 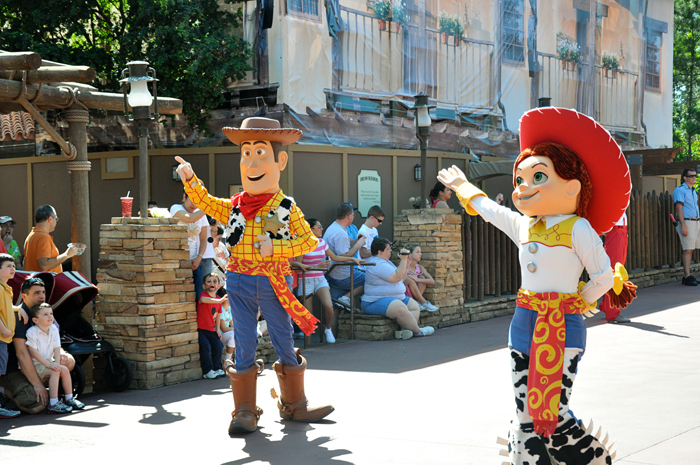 (THIS KID LOVES TO MEET THE CHARACTERS and had been asking about Woody and Jessie. However, Brax didn't want to meet any of them. It is neat to see their personality differences and how their age makes a huge difference in what they enjoy.) True story, Woody and Jessie left and B was still sleeping. Less than 2 minutes later the train came by, blew it's horn and B awoke crying :( However, it was time for the parade to start, so he got to see Woody and Jessie after all. Both boys enjoyed the parade and one of Brax's favorite characters came over and patted him on the head--Hook. 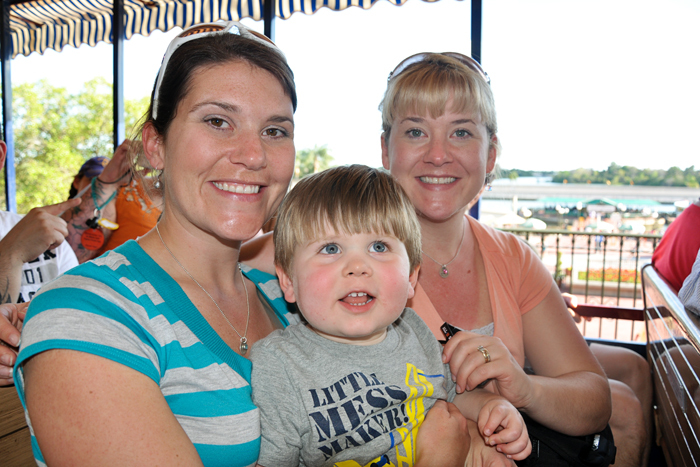 We were then able to watch the Country Bear Jamboree which is one of B's favorite rides from our last visit to Disney. He loves the talking Moose. He often walks around saying, "Singing bears, singing bears. Talking Moose." 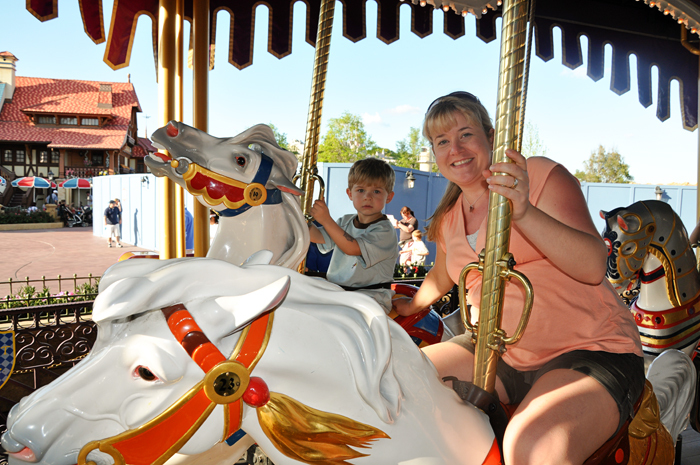 We rode Aladdin's flying carpet, the Pirates of the Caribbean, the train, Peter Pan and the carousel before circling back around to ride the cars and Buzz Lightyear. My sister and I are both pregnant (only 1 week apart), so it was I was glad they came to visit before we each become families of four. 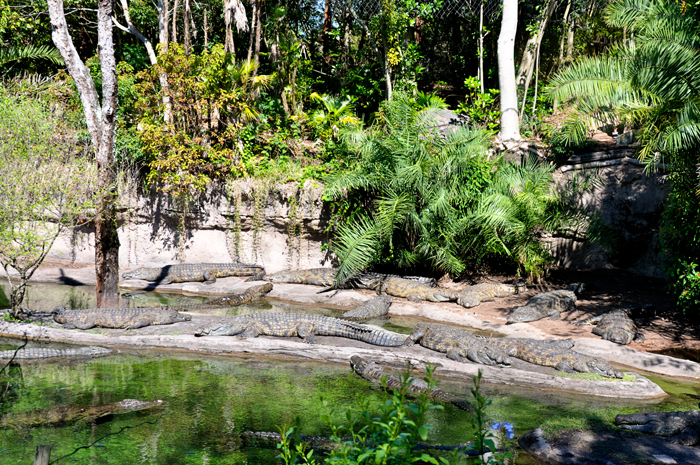 It will be much more difficult to make the trek from Tennessee to Florida after we each have another child. 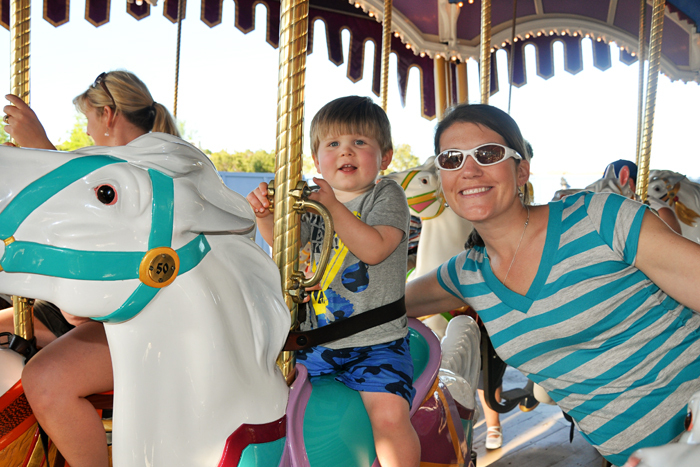 We left Magic Kingdom around 6:30 p.m. as Braxton was more than ready to go home. However, I think Bennett would have stayed for another 2 hours. 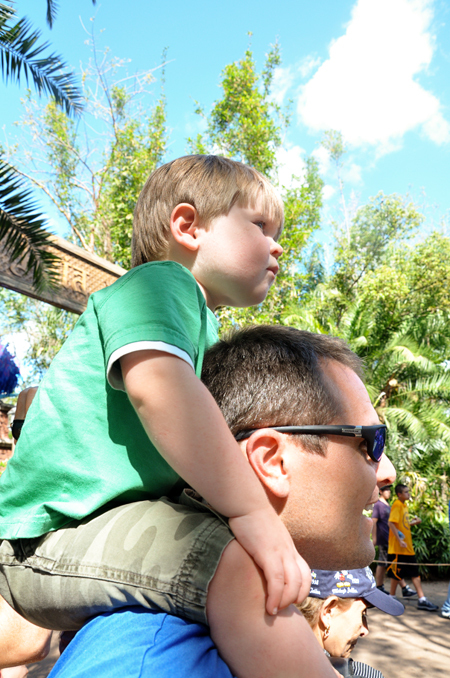 Monday we woke up and headed out for our first experience at Animal Kingdom. 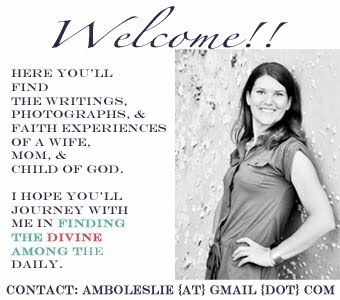 Before sharing our experience, let me point you to a great planning resource if you will be visiting anytime soon. 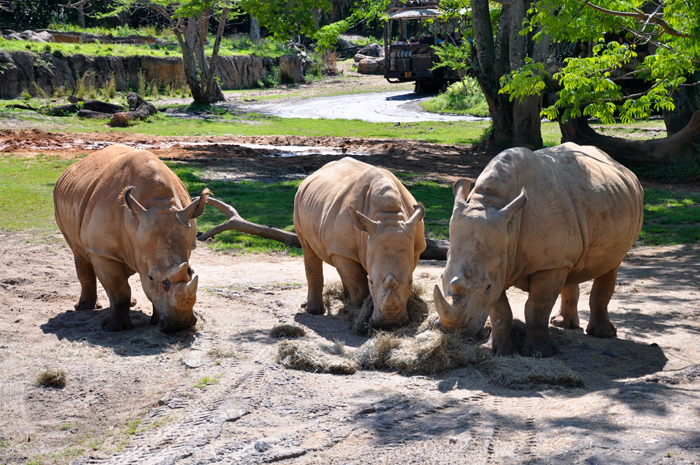 Living LIfe Intentionally shares a more than helpful post regarding Animal Kingdom and how to plan your day. We followed it loosely and it was extremely helpful. 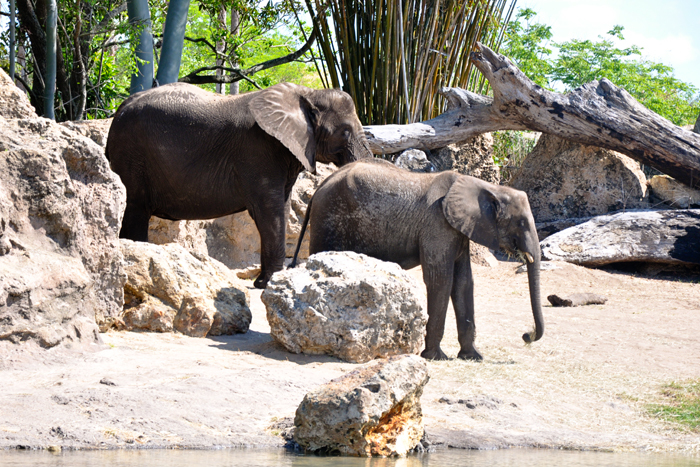 Upon arrival we walk to the back of the park where Africa is located and got in line for the Kilimanjaro safari. We had read that the safari was a must do, but that the line got long fast. Since we arrived about 30 minutes after the parked open, we only waited about 45 minutes. Everyone enjoyed seeing the animals and learning a few new facts. Plus, they are really close. We saw rhinos, elephants, giraffes, antelopes, wildebeests, crocodiles, hippos, zebras, ostriches, gazelles, and a few others I can't remember. B is still talking about all of the animals he saw on the safari ride, so much so that we have checked out a few safari books at the library. Upon exiting the safari you can walk right into the Pangani Forest Exploration Trail Walking Tour which has several types of birds and fish. 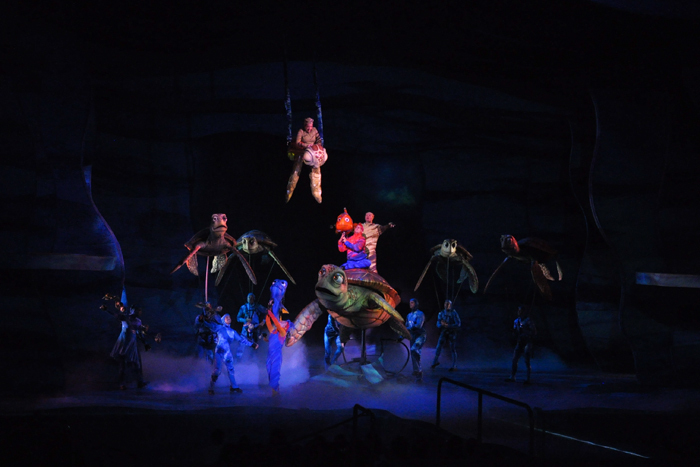 You can also see meerkats, frogs, and spiders. 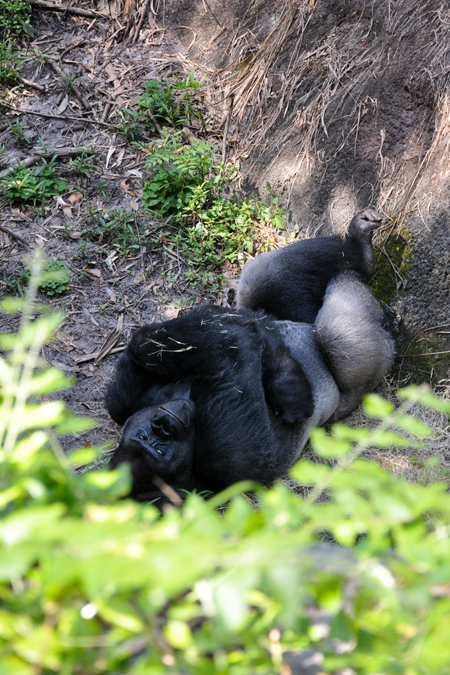 However, my (dare I say our) favorite part were the gorillas. They really put on a show. 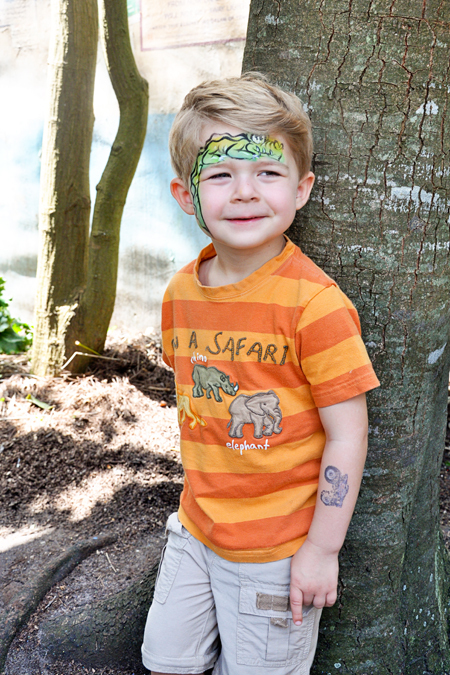 Braxton enjoyed the safari so much that he wanted to get a crocodile painted on his face. Okay, so he also loves to get his face painted. 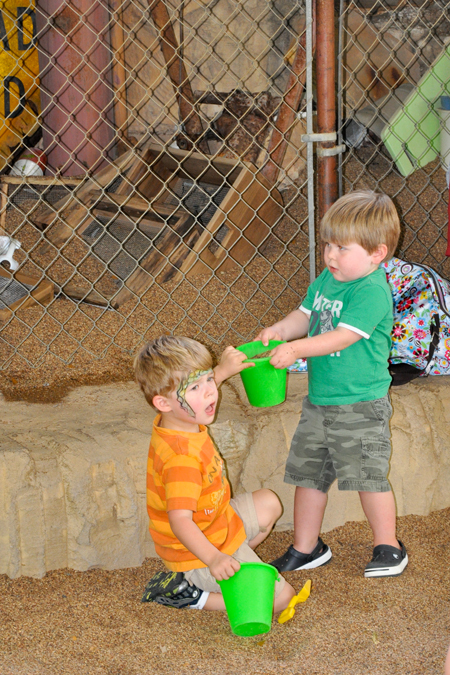 After a lunch break, we walked over to DinoLand, which was a perfect location for both of our boys who love dinosaurs. B was mesmerized by the large brachiosaurus. 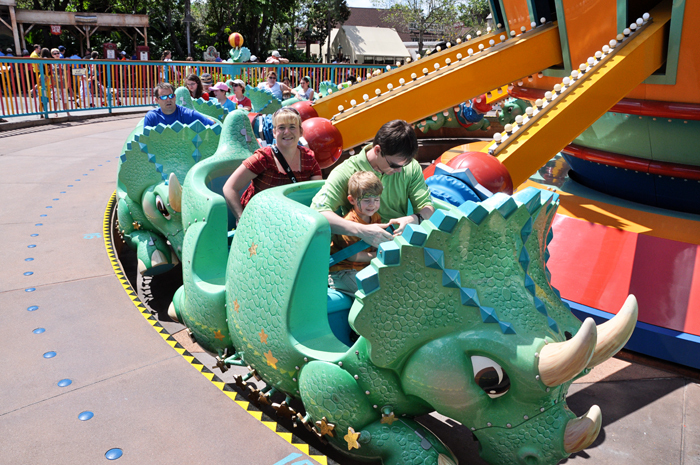 We rode the Triceratops ride before heading over to the Dino dig/play area. 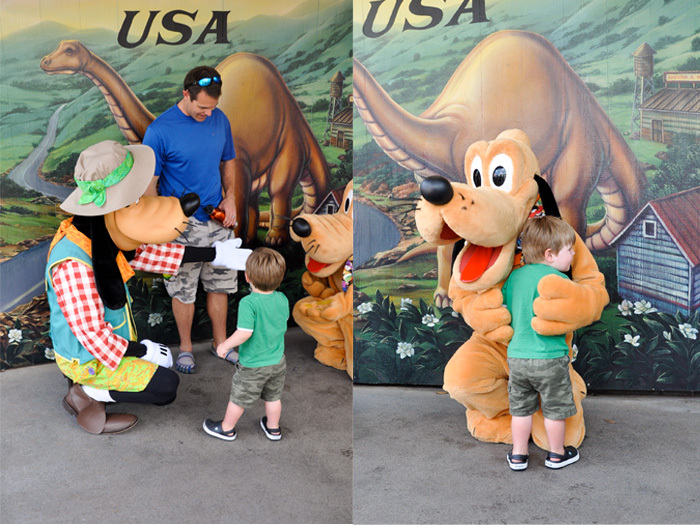 However, before walking over to the dino dig we spotted Pluto and Goofy. B asked if he could meet him, so waited for about 15 minutes to meet them. 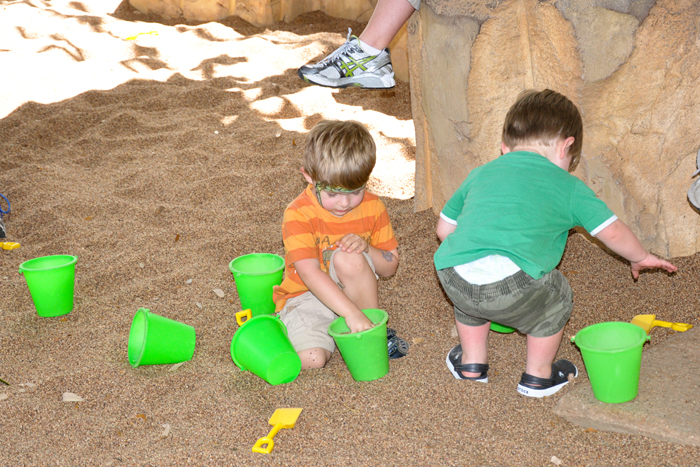 Both boys loved the dino dig and all of the slides that were located in the play area. However, I would say this was Brax's favorite part. And of course, I had to share the photo of their continual struggle over the same toy. The dads were on their way to ride Expedition Everest, while sis and I took the boys to watch the short 3D show It's Tough to be a Bug which scared the begeebees out of Braxton and left B asking for more. I will admit, I kept my eyes close for several minutes due to the fake spiders that descend from the ceiling. At this point, Brax was ready for a nap, but B was protesting....sweetly, so Sam and I took him back to watch It's Tough to be a Bug for the second time. Upon exiting we were in perfect position to watch the parade, which was AMAZING!!! 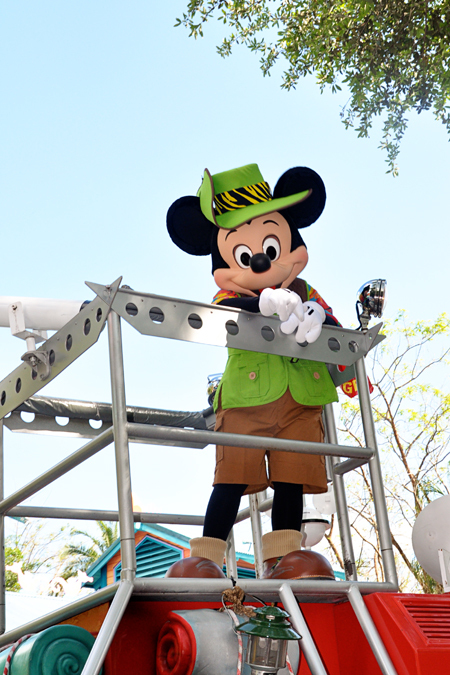 Animal Kingdom does a wonderful job creating the animals for their parade. I wasn't able to get any photos of the animals due to our location. Plus, B got to see all of the main Disney characters. The kids were hungry, so we decided to end the day with dinner at The Rainforest Cafe. While the environment is fun, the food is only okay and the service was sub-par. However, we were all thankful for the time to sit and relax before going back to the hotel. 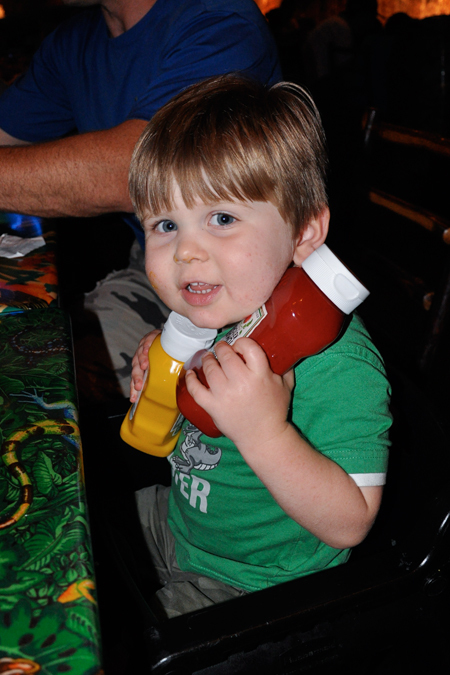 To end our evening, B decided to give the ketchup and mustard a hug goodbye!! 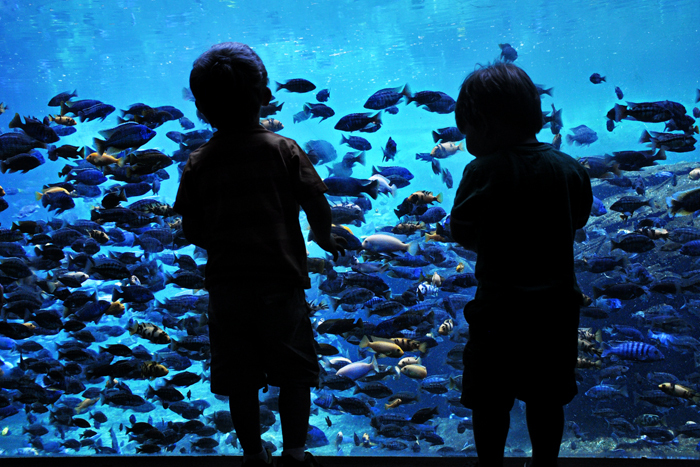 Living Life Intentionally also has posts regarding the perfect age to take your kids to Disney (which I now have my opinions that I may share in the future), Magic Kingdom, Hollywood Studios and Epcot. looks like a wonderful trip. Great photos. 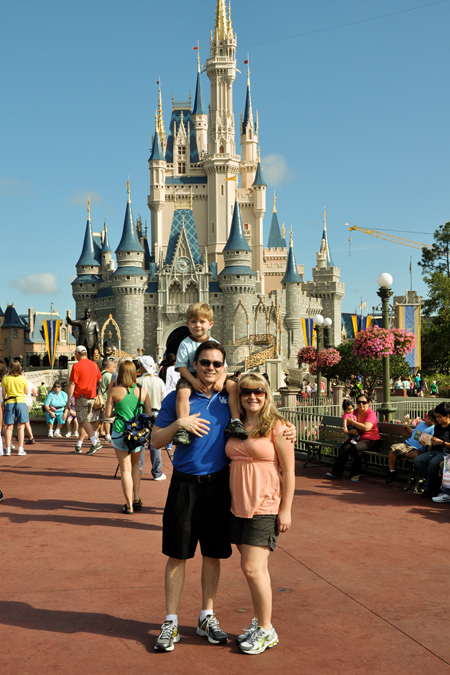 these photos make me want to go to disney! :) Looks like a great time! I love how you let the kids nap and continue on with your trek! I think that is great!